Ängby Camping has a history since the 40’s that we have carefully tried to preserve. The feeling is a little nostalgic with accommodation in small cabins or with your caravan in smaller places, just like in old times. 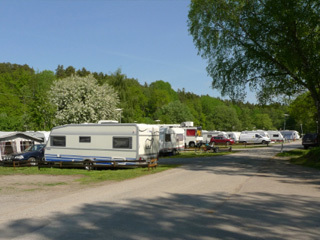 Ängby Camping is a two star family camping just 20 minutes from Stockholm City. Click for more information and maps. 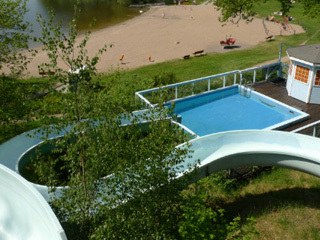 The site is located on Lake Mälaren with the Ängby open-air swimming area with jetty and water-slide surronded by woodland and jogging track. We have 45 lodges for hire and a total of 160 pitches for caravans, motorhomes and tents. Some have electricity and a cabel-TV. Click for prices. 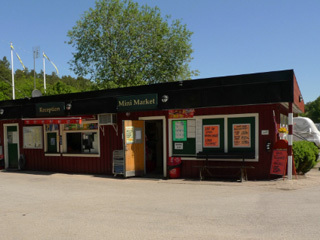 We spent a few nights here with our motorhome, very helpful man “oola” booked us in and advised accurately that tube into Stockholm was 500m away across the road from site and takes 22 mins into centre. Site is next to but not overlooking a lake. Play area beach slide etc all there for kids. showers and wc old but fine. For visiting the city this proved ideal for us. Stockholm was great. We stayed in one of the cabins - they look small on the outside, but seem slightly bigger on the inside! We had some kitchen units, a table and chairs, a set of bunk beds on the ground floor, then a mezzanine with 3 further beds on it. The cabins were a bit rustic - we had a bit of an ant problem in our kitchen cupboards, but being part of tour, it didn’t matter as were eating elsewhere - luckily the ants didn’t get as far as any of the beds! The mattresses were okay - you’ll need bedlinen or a sleeping bag.